← Adobe Discontinues Flash support for Mobile Devices: Steve Jobs Vindicated? The latest update to iOS 5 is important for a number of reasons, the primary one being that it lets us users get a taste of how it is to be able to download software updates directly to our mobile device. This means update anytime, anywhere, without PC tethering. One touted feature of iOS 5 for iPads, iPhone and iPod Touch is the wireless syncing and updating of your iDevice without having to be physically connected to your PC. Back in the day, it was simply a pain to download software updates via iTunes or even directly download the firmware- the perpetually busy iTunes server usually timed out on me just before the update was finished. 1) Back up your data, whether to iCloud or to your computer. You don’t want to lose your data! 2) The awesome thing about iOS5 is its wireless syncing feature, but you can still download the update via iTunes and connect your device to your computer. So if you want to do it the regular way, you still can. 3) If your want to download the update directly to your device, I suggest you ignore suggestions to download iOS 5.0.1 via iTunes on your computer while you download the update via your iDevice. Ensure a stable internet connection. In my case, i did everything via my Myfi router on a prepaid sim. 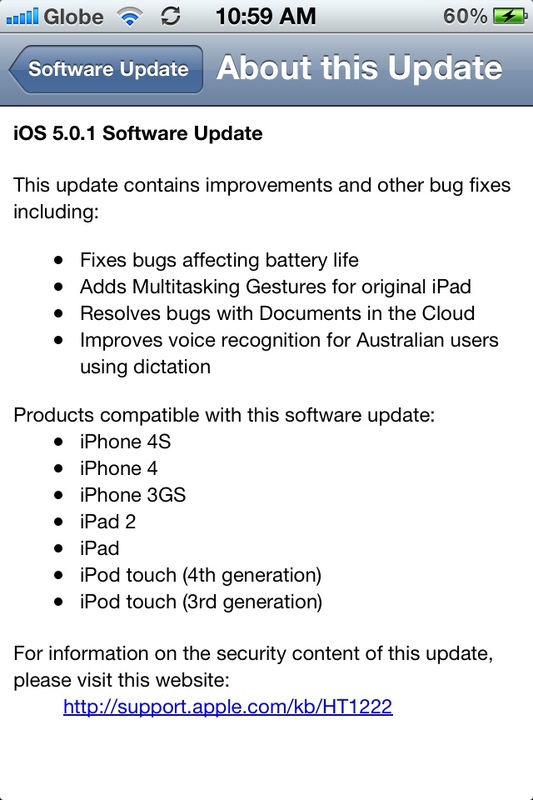 2) Check out the description of the changes in iOS 5.0.1. Tap on “Download and Update” and you will be prompted to agree to the terms and conditions from Apple, etc. 3) If your device is not connected to a power source and you have less than 50% battery remaining, you will receive a prompt reminding you to plug in your device. 4) Download time varies and also depends on the Internet connection – using my wireless portable wifi router, my iPhone took about 10-15 minutes, slightly longer than my iPad. 5) If you’re still not plugged in and you have less than 50% battery remaining, your device will refuse to install the update. So plug it in to avoid data loss, etc. 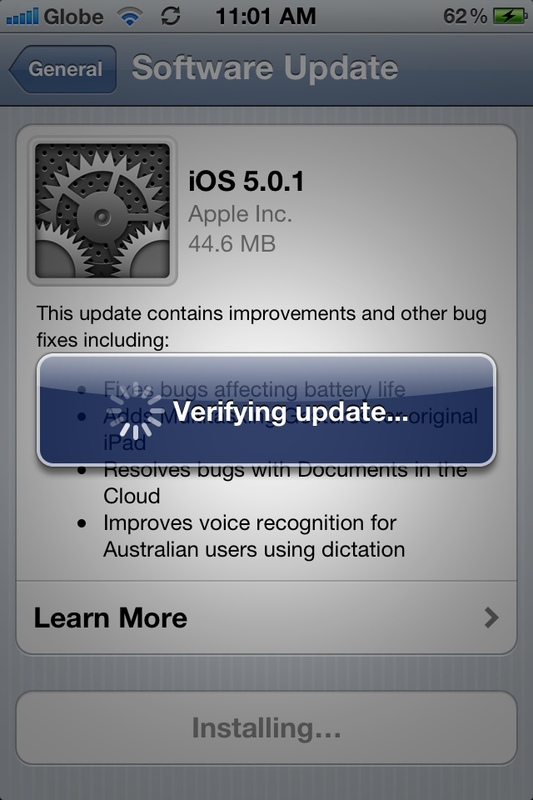 6) The update will take about 5-10 minutes to install, including the verification process with Apple’s server. 7) Don’t touch your device during this time. You will see the usual silver Apple logo while you wait, and a progress bar underneath which repeats itself until you just see the plain Apple logo. 8 ) The device will reset itself and start up as usual. However, in the case of my iPhone, it apparently reset the password for the wifi network I was connected to, which did not happen in the case of my iPad. 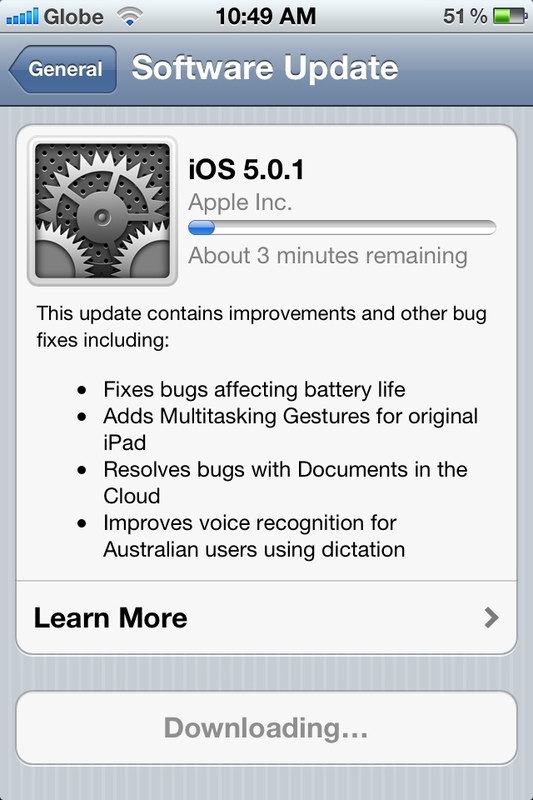 Have you updated to iOS 5.0.1? Was it smooth sailing for you? Great posting. Apple should have written it. WTF will lose all my apps etc. if I update? why then would i? What happened to your apps after the update? (updating your iphone without a PC) was it restored automatically? Of your device on the left, do a right click of your device and hit back up. Ideally, it should save your data. Just make sure you don’t interfere with your iPhone or iPad while the update is being installed. To be safe, don’t forget to back up your existing data first before updating to a new iOS firmware. Whenever I go into settings then general, software update does not come up. Why is this and can you please tell me what to do? Thanks. Very appriciated! I updated on my Ipad 2 up to backing up and then was asked to restart the computer to complete the process and my Ipad went blank. I tried to restart my Ipad with no success. Please help! to which your iPad is connected? Would I lose data on my iPad2 if I upgrade to iOS 5.1? I have a lot of data on it. Just make sure you do a full back-up first via iCloud or wirelessly to your computer via iTunes wifi sync. Personally, it’s safer to still back up your data physically and then once safely backed up, update via OTA. I have an iPad 1 which when going into Settings – General, I don’t have a Software Update. Please can you tell me how to update to 5.1.
ok totally confused! 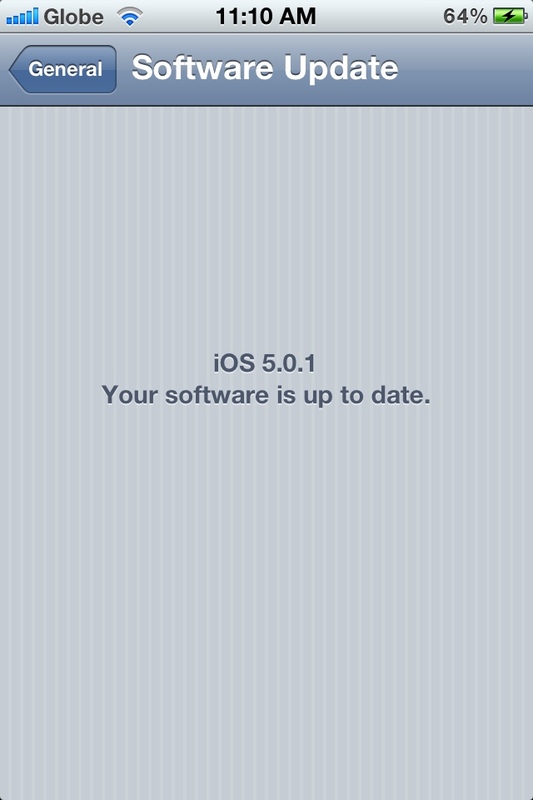 i do not have the software setting either so tell me in specific directions ow to update to iOS 5. I’ve tried hooking up to my desktop and all it does is keeps saying that its backing up my Ipad2. Need someone to help me with this! It’s backing up your data which iTunes does automatically. Please look for the summary tab which tells you whether or not you need a software update. It tells me I need an update but only gets halfway through says it can’t be done. I agree with Dee I need help with this.